Willie's BBQ can provide exceptional catering services for any even - big or small. We serve up delicious BBQ meats, sides, and drinks to corporate events, birthday parties, anniversaries, graduation parties, weddings, and more. 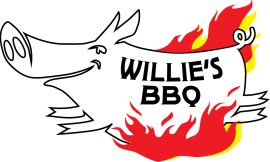 Contact us today to sign-up for for Willie's BBQ catering. Here is our updated catering menu.